Foam Rolling is one of the techniques with use in my personal training studio to help people improve their flexibility, release tight connective tissue and increase range of motion of their joints. Below video is an example of some of the exercises using a foam roller. Enjoy the video, proceed with caution and if you have any question please let me know. A molded foam roller that does not contain cells making them last three times longer than traditional celled white foam rollers. Available in 5 sizes. Use round rollers for stability exercises and myofascial release and alignment and half round rollers for balance and stabilization. Also can be used for Pilates, Yoga, Massage Therapy, and Physical Therapy. Get yours today by clicking below and start foam rolling today. 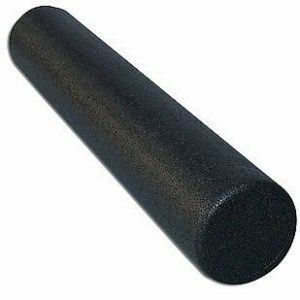 There are different types of foam rollers. Some are soft, hard, and some have even some spikes in them. In my studio i recommend to use the one pictured below.